Amjad Islam Amjad mentioned Syed Sarfraz A. Shah Sahib's book 'Kahe Faqeer' and some golden words from it in his article today. Syed Sarfraz Shah Sahib many times discussed Future of Pakistan according to 'Design of Nature and Will of God' in recent times. 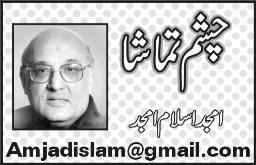 Lets read some excerpts about Design of Nature then read Amjad Islam Amjad's Article. Now above reading can help us to understand Design of Nature Quote in below article.